ARLINGTON, Va. (CNS) — For the three nights leading up to the pope’s arrival in Washington, Iris Chavez, 25, worked on a tilma for her 5-month-old son, Loukas, to wear to see the pope along Constitution Avenue. She used an apron, stamped the image of the Virgin of Guadalupe on it and attached brightly colored flowers. “Ever since we heard the pope was coming, we said we had to go,” said the parishioner of All Saints Church in Manassas. Iris, her husband, Rigoberto, 28, daughter Emily, 2, and Loukas, spent the night before at her father-in-law’s home in Washington. At 4 a.m. (EDT) Sept. 23, when the security gates opened, the four were there to claim their spot on the White House side of Constitution Avenue across from the Washington Monument. Loukas was sound asleep when the pope was leaving the White House to begin his popemobile procession down Constitution Avenue. She tried to wake him up so he could see the pope, but it wasn’t until the motorcycles in the motorcade came past that he woke up suddenly. She was afraid he’d start crying, but he was fine, just looking around and smiling. She held him up high so he could see. “The popemobile stopped right in front of us. I’m not sure if it was Secret Service or Vatican (security), but a man rushed over to us.” Iris said she wondered what was going on. 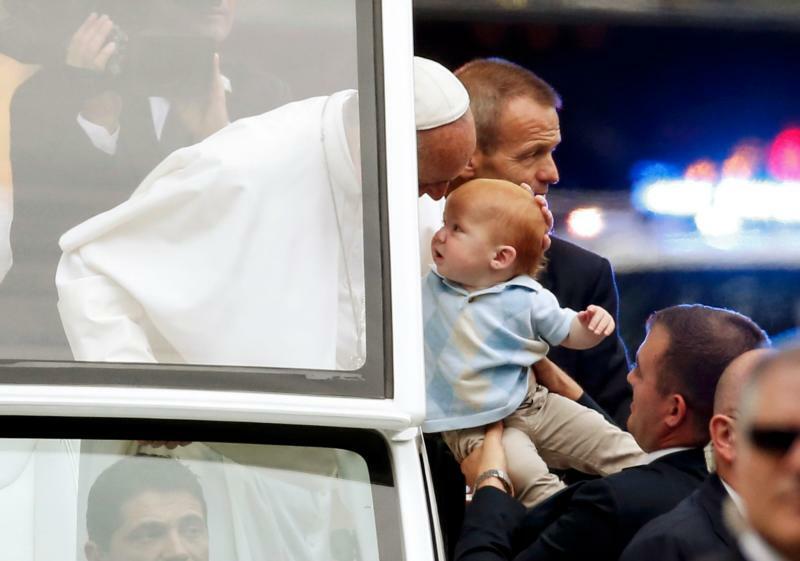 One of her church friends in the front grabbed Loukas, and before she realized what was happening, her baby boy was heading to see the pope in his new tilma, pacifier in place. The pope blessed him and kissed him on the head, and then handed him back. Iris said Loukas didn’t appear scared at all. Big sister Emily was sitting on her father’s shoulders several yards behind. When she saw her little brother being taken to the pope she clapped and cheered, “Loukas, Loukas.” Her father said later when he saw the pope stop there, his heart stopped. “There were so many people there and to see that it was your child, what a beautiful experience,” Iris said. “He’s got a lot of responsibility on his shoulders. Iris works part time at the parish with Father Juan Puigbo, parochial vicar. During the parade, parish receptionist Cristina Jimenez had been watching the coverage on TV when she saw a baby that looked like Loukas. Minutes later, Father Puigbo called the office to confirm: Iris had called him with the news of the special blessing. Iris came to the United States from El Salvador at age 11 with her mom and brother to join her father. Rigoberto came with his brother when he was 16 to be with his parents. High school sweethearts, they experienced a “conversion” after attending Cursillo, a Catholic spiritual retreat. The Chavez family has a very active church life, and “the kids are part of it; it’s a package deal for the four of us,” Iris said. “We go from here to there, lots going on, but it’s worth it because in the end God is with us. ***Augherton is managing editor of the Arlington Catholic Herald, newspaper of the Diocese of Arlington.